Wow! Really stunning card. 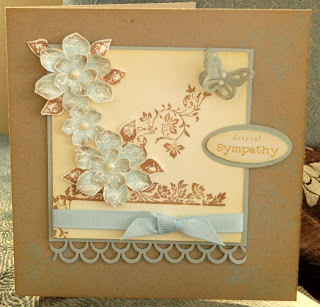 Love the blooms and the pretty pale blue. Thanks for joining our CAS challenge at Totally Papercrafts this week. Totally love and own this set, and you've inspired me to get it out! This kraft and blue combo is super pretty, very feminine and shabby chic. Sylvie, back in 2002 my husband I visited Gibraltar! We come from New Jersey in the United States, but were visiting in Spain. We stayed in the Hotel Puente Romano, near Marbella. Trying to remember the name of the town, or maybe Marbella was the town. It was on the Meditteranean. LOVED Spain and our brief guided tour in Gibraltar too.